HomeBlogThe BibleDid Jesus Have Second Thoughts? Before Jesus is captured and executed, he spends some time praying. At one point in his prayer, Jesus asks God for a reprieve—that he won’t have to die—even though that was the plan all along. But he’s quick to add an addendum, confirming he’ll do whatever his papa wants. I wonder if Jesus is thinking about the test God gave Abraham, commanding the patriarch to kill his son Isaac. Just as Abraham is preparing to plunge the knife into his son in total obedience, God says, “Wait.” Then he provides a different sacrifice, a substitute. Isaac is spared. I wonder if Jesus pauses, hoping that God will again say, “Wait” and provide a substitute sacrifice or a different solution. But this time God the Father doesn’t, and Jesus willingly dies as a once-and-for-all way to reunite us with Father God. 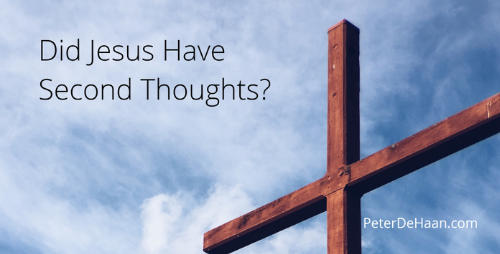 When it comes to Jesus dying instead of us and taking our punishment on himself, he doesn’t have second thoughts, but he is open to alternatives. When John writes about Jesus, he records a different prayer. In this prayer, Jesus admits his anguish about dying, but he knows he can’t ask God to intervene. He acknowledges that dying is why he came to earth. He will do it—and he does. Jesus dies to make us right with the Father. Though our wrongs separate us from him, Jesus takes our punishment upon himself, thereby making us right with the Father.